Cast: Klaus Kinski, Isabelle Adjani, Bruno Ganz, Roland Topor, Walter Ladengast, Dan van Husen, Jan Groth, Carsten Bodinus, Martje Grohmann. 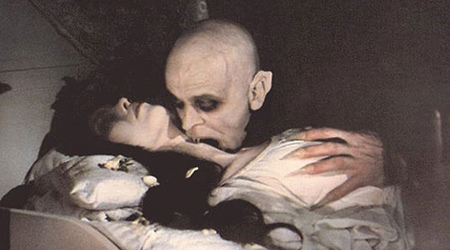 Simultaneously filmed, shot for shot, in separate English and German-language versions, "Nosferatu the Vampyre" is writer-director Werner Herzog's (2005's "Grizzly Man") stab at making an artsy remake/update of 1922's "Nosferatu." With Bram Stoker's "Dracula" in the public domain by this time, Herzog was able to use most of the characters from that novel (though, oddly enough, he switched the identities of Lucy and friend Mina) while retaining the story of filmmaker F.W. Murnau's original. Klaus Kinski, taking over for the incomparably creepy Max Schreck, is suitably ghastly as Count Dracula, a vampire who moves to a small German village and sets off a false paranoia among the townspeople, who confuse his victims for those of a deadly plague. "Nosferatu the Vampyre" reminds quite a bit of a "Masterpiece Theater" version of the taleit's rather stuffy in spots, and lacks a lot of its silent predecessor's iconic imagerybut there nonetheless are several striking segments and shots, including an aerial view of lines of coffins being carried into the town square. Isabelle Adjani is ethereal as Lucy, who risks her own life to save her community from total ruin, and the picture, if not an equal to its source material, remains a serious-minded, true-in-spirit redux.